Looking for Wii tools? You came to the right place! We now have all the tools you need to open the Nintendo Wii. There are two types of screws on the case of the Nintendo Wii that make it difficult to open. In addition to several tri wing screws, there are also four very small Phillips or cross wing screws. It is very easy to strip these Phillips screws if the proper size screw driver is not used. The proper size of Phillips screwdriver for these screws is much smaller than the commonly available #0 size. Our set includes a #000 or 1.5mm Phillips screwdriver that is just right for removing the cross wing screws on the case of the Wii. This set also includes a full length tri wing screwdriver that easily removes all the tri wing screws on the Nintendo Wii. 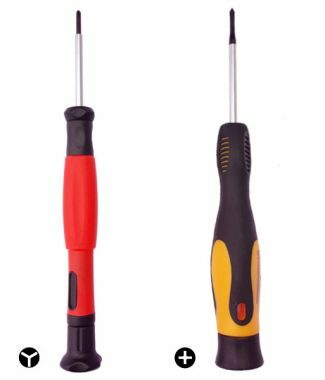 Both screwdrivers feature a rotating end cap that lets you apply the correct amount of pressure to the screw to prevent stripping. The tri wing driver is also compatible with other Nintendo gaming devices such as the Wii nunchuck and Wiimote, the GameCube console and controllers, the Nintendo DS, the DS Lite, Gameboy Advance, and Gameboy Advance SP. You can also use this tri wing screwdriver to remove the screws on some cell phones and laptops including the Apple Mac Book Pro. Read more about Wii Tools here.